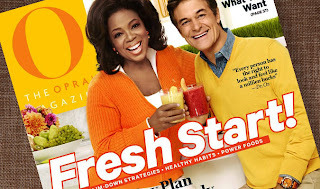 $4.00 for 1-year Subscription to O, The Oprah Magazine! $54 Value! Right now at Plum District, you can get a 1-year subscription to O, The Oprah Magazine for as low as $4.00! The deal is being sold for $12, but you can get it down to just $4.00. This fabulous magazine encourages confident, intelligent women to reach for their dreams and make choices that will lead to happier and more fulfilling lives. With lush photography gracing oversized pages, each issue offers compelling stories and empowering ideas stamped with Oprah's unique vision on health and fitness; relationships and self-discovery; beauty and fashion; home design; and food news. Again, click here to get a $5 credit, then click here to be brought to the deal, then use code best25 to save 25%!